We at I Tech Zone are a leading and full-fledged Joomla development service provider company based in India. Joomla is a Content Management System (CMS) which is highly preferred to create websites, build web portals and scale different applications. 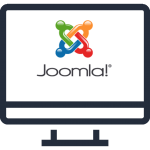 We offer customized Joomla development solutions by providing flexible features, functionalities and extensions. We commence your Joomla development project only after categorizing the requirements of your target users as per the products and services they need from your website or application. This really assists us in delivering you a superior web portal with high marketing and sales conversion rates. Our developers work on the whole individuality of your site pr portal from an appealing design work to exclusive copywriting. We do not tag along the development assignment blindly, but our proficient team devotes sufficient time to plan an efficient layout for each web page incorporating the business goals, features and needed functionalities. When we are at our jobs, you can fully expect powerful and scalable Joomla solutions that assist in engaging your target users with enhancements. We also take care of the visual appeal of your Joomla applications development to take your business to the next level. Components are a central part of Joomla web portals; we can transform your site with tailored component development. CONNECT US WITH US WITHOUT ANY DELAY!